We carry several high quality water pumps that can be used in a variety of applications. Check out our guide to determine which pump will best suit your needs. 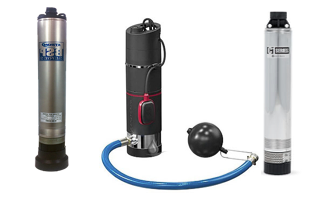 Have a cabin, mobile home, tiny home, or building with limited or no indoor utility space: Grundfos MQ with keypad cover, Grundfos SBA 3-45-AW, Strom BSP (3/4HP). PLEASE NOTE: Winterization of pumps will be required if you live in an area where temps get below freezing. Want to supply a house or building with pressurized water, and the home/building has at least 4 sq ft of floor space in a utility room: Franklin C1 with 20-gallon pressure tank, Franklin VersaJet 3/4HP pump with pressure tank. PLEASE NOTE: Winterization of pumps will be required if you live in an area where temps get below freezing. Do UV Sterilization Systems Really Work? Is My Home a Good Candidate for a Cistern?